“Le train du climat” has been selected to receive the award for its very innovative and original concept to develop an exhibition on a train, as a catalyst for discussion and debate about climate change issues, between scientists and cultural mediators present on board and general public. 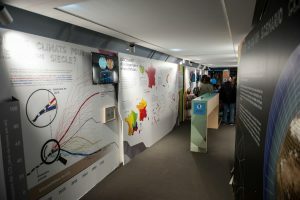 Taking place on the eve of the Paris accord negotiations in 2015, the project has been very successful and has met its main goal, which was to advance climate literacy and to contribute to science-based policy making and individual actions, by raising public awareness and delivering a nationwide message about climate change. The exhibition has been built as a narrative story using a combination of state of the art outreach methods to educate the public. On its 3-week journey around France and 19 stopover cities in total, the train reached 23,000 people plus ~3000 school children and ~1000 decision makers and elected representatives. It also received an extensive coverage in media, which included TV, radio and news papers. 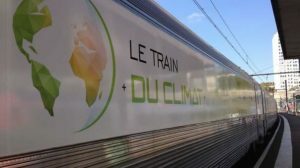 The idea of a train-based outreach tool for climate has been taken up in 2016 by Morocco for COP22 in Marrakesh and a new edition of Le train du climat is planned in France again in 2017-2019 with a special focus on solutions at regional scale. 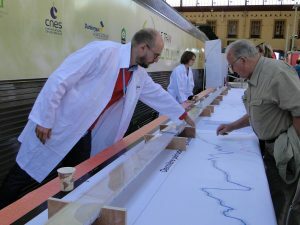 The project was collectively devised by Christophe Cassou, Research scientist at CNRS/Cerfacs (Centre National de Recherche Scientifique), Catherine Jeandel, Research Director at CNRS, Beatrice Korc, a free-lance editorial manager, and Serge Planton, a Climate Researcher at Météo-France. 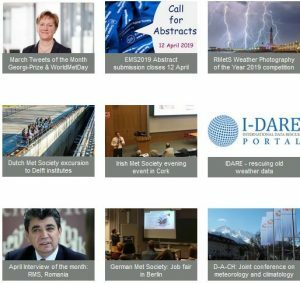 42 scientists of very diverse expertise from 13 different institutes were on board. The project was strongly supported by SNCF, the French National Railway Company, and Train-Expos, its subsidiary, together with the ministries of Education & Research and Ecology.